"Boom! You're looking the wrong way. It's behind you!" 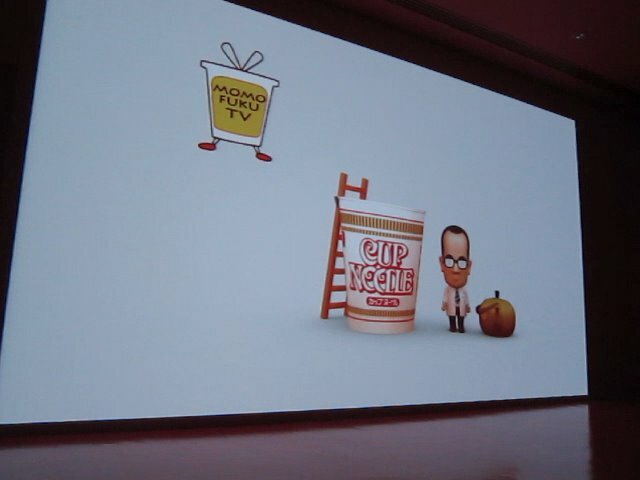 So we decided to ditch Noodle World and head down the street to the new Cupnoodles Museum in Yokohama. Opened only last month, the new Cupnoodles Museum was built to commemorate the 40th anniversary of cup noodles. And it's fricken huge! Similar to the Instant Ramen Museum in Osaka, the walls are lined with all the different Nissin products dating back to the first Chikin Ramen. Wait. Kalbi? Bacon? Now that's what I'm talkin' bout! Time for the red room! I took video of this film, but I'm afraid to post it publicly. It basically told the history of Momofuku Ando and how he never gave up despite failing several times. And it reminded us that it's never too late to follow your dreams. 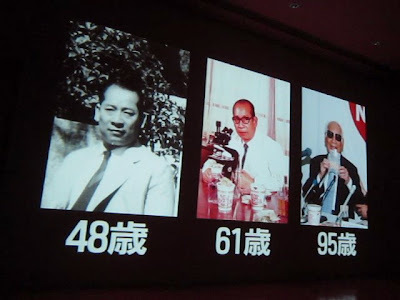 Momofuku Ando invented Chikin Ramen at age 48, Cup Noodles at age 61, and Space Noodles at age 95. 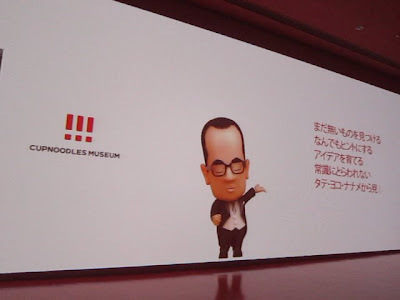 The rest of the museum just reiterated the video in more detail. And there was some cool cup noodle art. This map/graph depicts how much cup noodles is consumed around the world. Dang! China is king! Word. Hey that guy looks familiar! Remember when I made my own cup ramen in Osaka? Well, you can do the same thing here, but all the tickets were sold out by the time we arrived. The school was sold out too. And enjoy the view of Yokohama Bay. Okay, all this ramen viewing was making us crave more ramen. So on our way home we stopped at Miharu (らーめん 瞠恵比寿店) in Ebisu. Hmm...it tasted a bit like Watanabe. And what do you know, they have a history. Good stuff, but there is an aftertaste that tends to linger. Check out this view. Can you see Tokyo Tower? Anyway, I met the assistant in Ginza for dinner. I'm gonna miss nights like these. In fact, I already do. Hmm...maybe someday there will be a !! 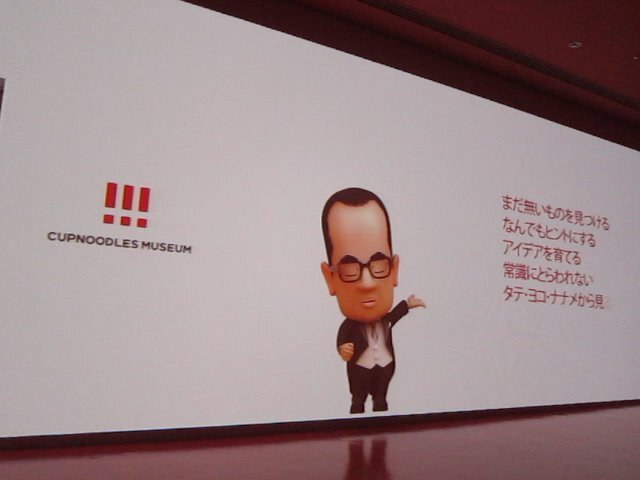 !GO RAMEN MUSEUM. I'm allowed to dream, right?